Sand Train with two BNSF locomotives and an NS one SB past MP 22.5 at 1:28 pm. E271 was by MC depot at 09:04. Train 451 NB past MP 22.5 at 2 pm with a CN locomotive leading CPRail 5046 which looked like one of their old SD40-2's with the extended short hood for radio control equipment for the old-days DPU operations across the Rockies. In the old days you never saw a CP locomotive on CN: hated each other too much! Manistique wrote: Train 451 NB past MP 22.5 at 2 pm with a CN locomotive leading CPRail 5046 which looked like one of their old SD40-2's with the extended short hood for radio control equipment for the old-days DPU operations across the Rockies. In the old days you never saw a CP locomotive on CN: hated each other too much! Manistique, read on the previous page! That engine was 2nd in consist on train 385 yesterday! 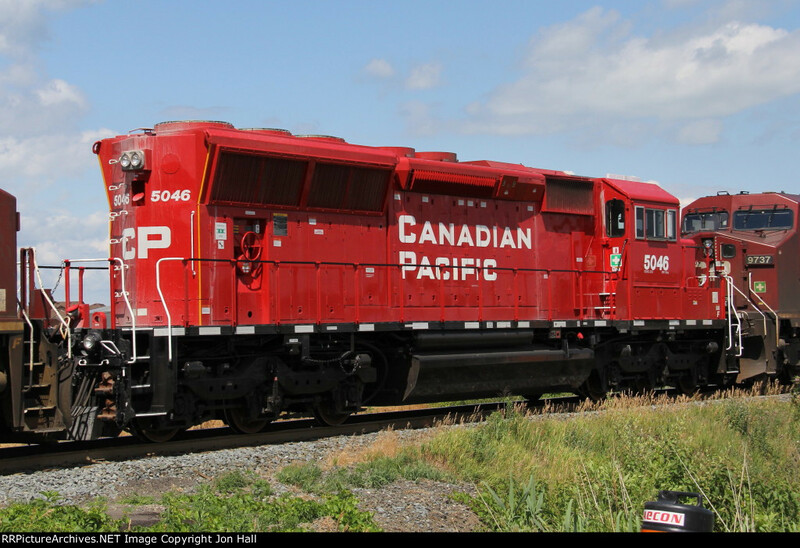 It's a "Re-built" Eco SD40-2, now CP SD30C-ECO #5046!!!! I bet the CN engine leading is also from yesterday's 385, C40-8W #2099!!!! L533S by North Mount at 18:25. CN 5608, 2 empty centerbeams. M385 by Mount Clemens depot at 19:02. CN 5650/CN/CN, 105 cars. M384 by MTC 21.7 at 20:10. CN/BCOL, 136 cars. Man o' War wrote: M384 by MTC 21.7 at 20:10. CN/BCOL, 136 cars. Yup I saw this one! I counted 137 cars though! CN C44-9W #2505, BCOL "Cowl" C40-8M #4625, cleared Masonic Road, Fraser, 8:01 p.m. This was my last train of being 34!!!! L533N, CN 5608, by North Mount at 23:24. M382 was by Mount Clemens depot at 01:33. CN/IC, 126 cars. M383 was by MC depot at 05:38. 451 was by Royal Oak at 3:42pm. BNSF 5951, UP 8243 and GTW 6223. The BNSF and UP engines were on this mornings 116. L533S by South Mount at 16:03. CN 5608, 72 containers. Man o' War wrote: L533S by South Mount at 16:03. CN 5608, 72 containers. Yup, this was my first train of being 35!!!! I photographed it in Fraser─CN SD70I #5608, 16 loaded "Well Car" sets, 4:13 p.m. Westbound through Lapeer. CN GE, NS GE and CN EMD. 168 cars. Quite a few box cars. Eastbound through Lapeer. CN EMD, UP, CN GE. 131 cars. Mostly an assortment of tank cars. WB on track 4 in Port Huron. Pair of CN units- 3068 is trailing 2913. They weren't moving all that fast through the yard, but they were moving steadily. Maybe there's something to that new style of running through the tunnel I've been reading about. Westbound windmill train through Lapeer. CN GE and CN EMD. I photographed northbound train 384 (after 'Hand/Foot Juice') with CN SD70M-2 #8906, CN SD75I #5694, 77 cars, cleared Masonic Road, Fraser at 8:27 p.m. NOW!!!! Train 451 with a BNSF leading CEFX 1011 NB flying past MP 22.5 at 10:47 am. Train 391 NB past MP 22.5 at 7:45 pm with IC 1037 leading a CN 5600 series.